241 Marlborough is located on the north side of Marlborough, between Exeter and Fairfield, with 239 Marlborough to the east and 245 Marlborough to the west. 241 Marlborough was designed by architect Samuel D. Kelley and built in 1882-1883 by building contractor Samuel Tarbell Ames for speculative sale. Samuel T. Ames is shown as the owner on the original building permit application, dated October 9, 1882. 241 Marlborough was built on land owned by Samuel T. Ames’s son, Harvard law professor James Barr Ames, who had purchased the land on October 16, 1882, from real estate dealer Samuel Horatio Whitwell. S. Horatio Whitwell had assembled the 23.33 foot wide lot for 241 Marlborough from two parcels: the eastern 15 feet of a 45 foot wide lot he purchased on August 24, 1881, from the Commonwealth of Massachusetts, and an 8.33 foot wide lot he purchased from Eben D. Jordan and Charles Marsh on September 1, 1883. 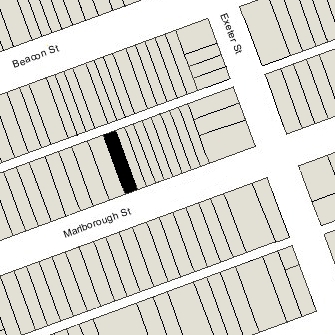 The 8.33 foot wide lot was the vacant portion of a 75 foot wide lot that Eben D. Jordan and Charles Marsh had purchased on February 28, 1877, from George Wheatland, Jr., along with the four houses he had built on it at 233-235-237-239 Marlborough. George Wheatland, Jr., had purchased the lot from the Commonwealth on November 28, 1876. Click here for an index to the deeds for 241 Marlborough. On May 12, 1883, 241 Marlborough was purchased from James Barr Ames by Richard Olney. He and his wife, Agnes (Thomas) Olney, made it their home. They previously had lived at 175 Marlborough. 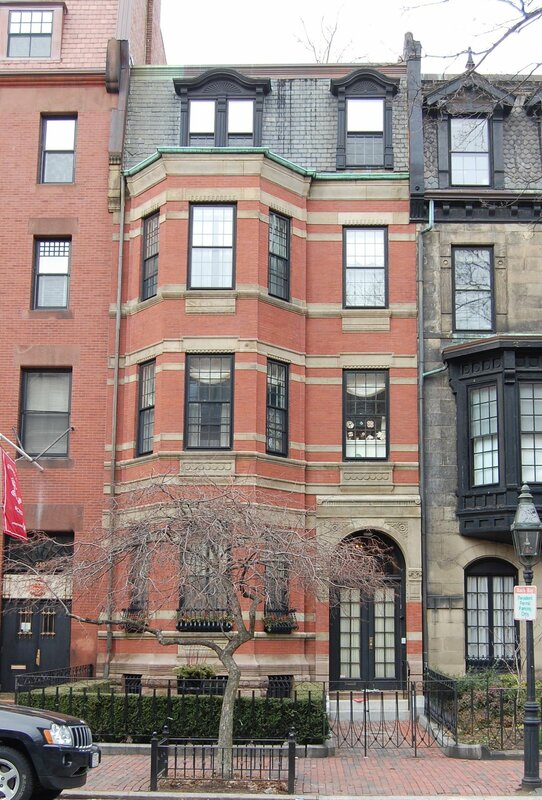 The Olneys continued to live during the 1889-1890 winter season, but moved soon thereafter to the Hotel Kensington at 687 (307) Boylston, and then to a new home they had built at 415 Commonwealth. On May 31, 1890, 241 Marlborough was purchased from Richard Olney by Miss Madeleine Curtis Mixter. She previously had lived at 120 Marlborough. During the 1907-1908 winter season, she was living elsewhere and 241 Marlborough was the home of Miss Ida Gertrude Beal and her sister, Miss Judith Drew Beal. They had lived at 361 Beacon the previous season. They subsequently traveled abroad, and then resumed living at 361 Beacon. By the 1908-1909 winter season, Madeleine Mixter was once again living at 241 Beacon. She continued to live there until her death in October of 1915. In her will, she left the residue of her estate, including 241 Marlborough, in trust for the benefit of her sister, Helen Kortright (Mixter) Appleton, the former wife of Randolph Morgan Appleton, and their three daughters, Madeleine (Appleton) Kidder, the wife of Alfred Vincent Kidder, Julia Appleton, and Sybil Appleton. Randolph Appleton was a retired lawyer; he owned a farm in Ipswich, where he resided. During the 1915-1916 winter season, 241 Marlborough was the home of Joseph Grafton Minot and his wife, Honora Elizabeth Temple (Winthrop) Minot. He was treasurer of the Tudor Company, a shipping merchant specializing in the worldwide shipping of ice. The Minots had traveled abroad during the previous season and their home at 301 Berkeley still was leased to others. They had resumed living there by the next season. By the 1916-1917 winter season, 241 Marlborough had become the home of Helen Kortright (Mixter) Appleton and her two unmarried daughters, Julia and Sybil. Julia Appleton married in October of 1917 to Charles Sumner Bird, Jr., an executive in his family’s roofing materials firm. After their marriage, they lived at 8 West Hill Place and then 68 Beacon while he served as a captain in the Army. Helen Appleton and Sybil continued to live at 241 Marlborough in 1920. During the 1920-1921 winter season, Helen Appleton was traveling in Europe and Sybil Appleton was joined at 241 Marlborough by her brother-in-law and sister, Charles and Julia (Appleton) Bird. Their primary residence was in Westwood. After Helen Appleton’s return, she moved to an apartment at 259 Beacon and Sybil Appleton moved with her. During the 1921-1922 winter season, 241 Marlborough was the home of Hamilton Emmons and his wife Marian (Van Buren) Emmons. Their principal residence was in Leamington, England. By the 1922-1923 winter season, 241 Marlborough was the home of Frederic Amory and his niece, Margery (Margot) Sullivan Amory. They previously had lived at 279 Beacon. Frederic Amory was treasurer of a cotton mill. He was unmarried and had lived at 279 Beacon with Margery Amory’s parents, Robert and Katharine (Crehore) Amory, prior to their deaths. They continued to live there in 1924, but had moved to the Hotel Hamilton at 260 Clarendon by 1925. On July 16, 1924, 241 Marlborough was purchased from Madeleine Curtis Mixter’s estate by Helen (Nickerson) Sears, the wife of attorney Samuel Powers Sears. They previously had lived at 31 Lime and, before that, at 12 Hereford. They also maintained a home at East Brewster. In November of 1930, Samuel Sears applied for (and subsequently received) permission to construct a one-car garage at the rear of the property. In about 1936, the Sears were divorced. Samuel Sears moved to 8 Park and Helen Sears moved to an apartment at 276 Marlborough. She continued to own 241 Marlborough. 241 Marlborough was not listed in the 1937 Blue Book, nor in the 1937-1940 Lists of Residents. On January 29, 1940, 241 Marlborough was purchased by George Tyson, a stockbroker. 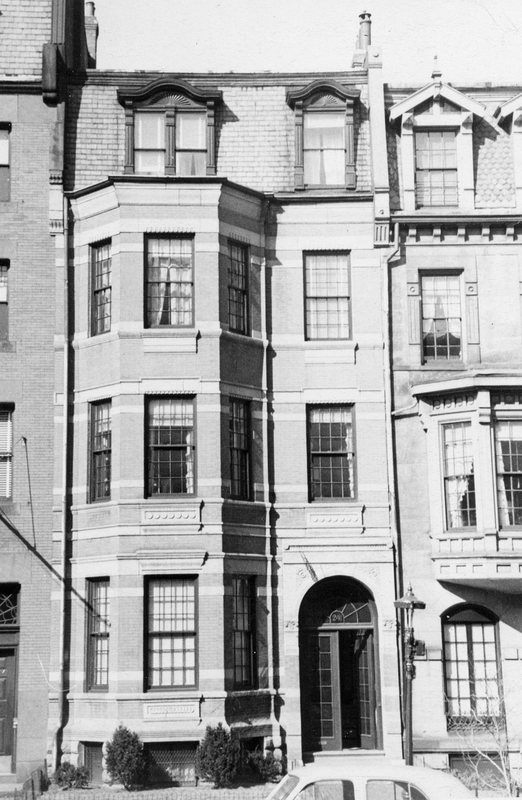 He and his wife, Marguerite Adelaide (Skirvin) Adams Tyson, lived at 1 Louisburg Square. They had married in September of 1937. Prior to her first marriage in 1920 to Robert J. Adams, Marguerite Skirvin had been an actress on the stage and in silent films. In February of 1940, he filed for (and subsequently received) permission to remodel the interior of 241 Marlborough, apparently in preparation for it to become the Boston residence of his sister-in-law, Perle (Skirvin) Mesta, the widow of George Mesta. Her primary residence was in Newport. On April 9, 1940, George Tyson transferred the property to Perle Mesta. The deed was not recorded until September 10, 1943, and he remained the assessed owner. Perle Mesta lived at 241 Marlborough in 1940 and early 1941, but moved soon thereafter to Washington DC, and became one of the capital’s leading hostesses. She was an early supporter of Harry Truman, who appointed her U. S. Minister to Luxembourg in 1949. Her appointment inspired Irving Berlin’s musical, “Call Me Madam” (book by Howard Lindsay and Russel Crouse), starring Ethel Merman. By 1942, 241 Marlborough was the home of Clare Peter Johnson, a retired attorney, and his wife, Dorothy (Swetland) Johnson. They previously had lived at The Miles Standish at 30 Bay State Road. They continued to live at 241 Marlborough in 1943. On September 10, 1943, 241 Marlborough was purchased from Perle Mesta by Alfred Dandridge Pittman and his wife, Beatrice Greenleaf (Thayer) Pittman. They previously had lived in Swampscott. He was a director of the Christian Science Church. They continued to live at 241 Marlborough until about 1960. On August 30, 1960, 241 Marlborough was purchased from the Pittmans by Paul R. Grosjean, a sales engineer, and his wife, Anne E. (Kicka) Grosjean. They previously had lived in Marshfield. On October 11, 1961, 241 Marlborough was purchased from the Grosjeans by Dr. John A. Twaddle, a physician, and his wife, Anne (Canty) Twaddle. They previously had lived at 31 Fairfield. He died in February of 1986, and she died in February of 2002. On July 1, 2003, 241 Marlborough was purchased from Anne Twaddle’s estate by Jonathan Daniel Seelig, an internet techonology executive and later a venture capitalist, and his wife, Margaret Devra (Gold) Seelig, an attorney and later a real estate adviser and broker. In December of 2003, they applied for (and subsequently received) permission to demolish and replace the garage at the rear of the property. 241 Marlborough remained a single-family dwelling in 2016.